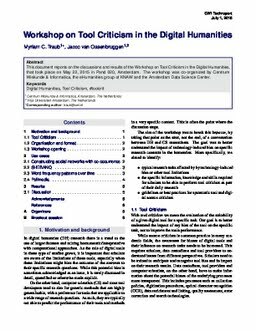 This document reports on the discussions and results of the Workshop on Tool Criticism in the Digital Humanities, that took place on May 22, 2015 in Pand 020, Amsterdam. The workshop was co-organized by Centrum Wiskunde & Informatica, the eHumanities group of KNAW and the Amsterdam Data Science Center. Traub, M.C, & van Ossenbruggen, J.R. (2015). Workshop on Tool Criticism in the Digital Humanities . Information Access [IA]. CWI.